What Are These Panic Bars You Speak Of? If you’ve ever been in a large office building, school or shopping center, chances are you’ve entered or exited the facility through a panic bar. Panic bars are a huge asset in the case of a major emergency situation. Specifically, they consist of a spring-loaded metal bar that is installed horizontally across the inside of a door. 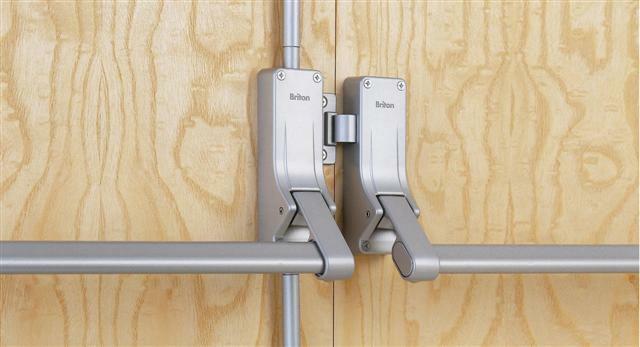 When this bar is pushed or activated, the door is unlatched, thereby allowing easy, fast access from a facility. As the door opens outward and not inward. We’ll get to the benefits of panic bars in a minute, but first, it’s important to note why they’re necessary in larger facilities. Think about what happens in crowded facilities whenever there’s an emergency – people usually panic and run for the exits. However, having the wrong types of doors installed in a facility actually does more harm than good in an emergency. For example, say you have a hoard of people running for the exit. And the person at the front of the group needs to abruptly stop to pull or twist a door open. Then there’s bound to be not only a great reduction in evacuation speed, but also potential for injuries and crashes. As a result, a logjam forms at the exits and the evacuation becomes a disorganized mess. Panic bars actually came to be based on several tragedies in history. Most notably, an 1883 incident at Victoria Hall in England where 180 children died because they were unable to exit the facility properly. Domestically, 600 people died in a fire at a theater in Chicago in 1903 when they couldn’t exit promptly either. One of the big benefits of panic bars is how safe they are, both in terms of streamlining evacuation, as well as in non-emergency situations. For instance, since panic bars are installed on the inside of the door, the door can remain locked to everyone on the outside to prevent unauthorized access to facilities. Furthermore, panic bars can also come equipped with an alarm system, so building supervisors are able to detect any unauthorized evacuation. However, to ensure the proper working of panic bars, it’s worth noting that they should only be installed by a locksmith. Building and property managers are always on the lookout for ways to improve building safety and security. But at the same time, they have budgets that they need to stay within, too. Panic bars, however, can be a win-win for these professionals. That’s because proper installation of such devices can actually lead to a decrease in the insurance premium on the facility. Just as how enhanced safety features on automobiles often come with a premium discount, the same is true for properties. So, while panic bars can help reduce the insurance premium, building managers shouldn’t stop there to make their facility safer. And save insurance money in the process. Things like carbon monoxide detectors, smoke alarms, good lighting in hallways and walkways, child-safe window hardware and portable fire extinguishers. These items can all go a long way toward increasing safety while reducing insurance costs. We already spent some time talking about the purpose and value of panic bars, but it’s worth mentioning again. 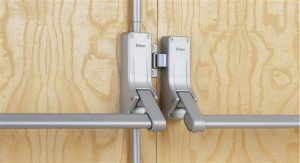 If these exit devices aren’t effective, they would not be advised by – and for some facilities, made mandatory, by OSHA. Think about some of the emergency situations that have occurred over the past several years – the Sandy Hook Elementary tragedy out east, the Boulder, Colorado movie theater shootings. It’s very likely that these incidents and tragedies could have been even more tragic. Especially if the schools and movie theaters that these events occurred at were without panic bars on the emergency doors. They always advise people to “stay calm” in the event of an emergency. But staying calm is not always practical when faced with an unexpected incident. Panic bars, essentially, allow for a faster, more effective way for people to evacuate a facility – and that can be the difference between life and death in many cases. If you’re looking to install panic bars at your facility, contact ASAP Locksmith today for a free phone estimate. Our Locksmith Company is available 24/7, and we can install your panic bar the same day in most cases.